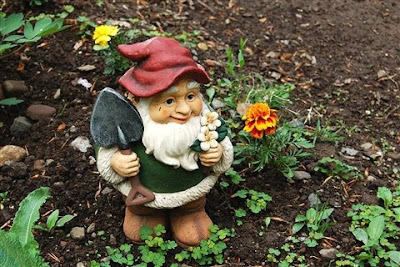 Capadia Designs: What happened to the Garden Gnome? On Thursday, I posted the digital challenge for FCTSC and I promised that I would show you my finished project - so here it is! I started with this photo of a garden gnome in the little garden beside my son's college housing. 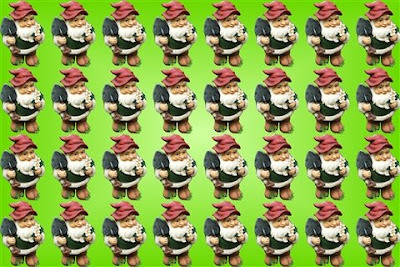 By outlining the gnome with the digital cropping tool, and adjusting the points to create a tidy cutting line, I was able to eliminate the background and save my cropped gnome as a PNG file. 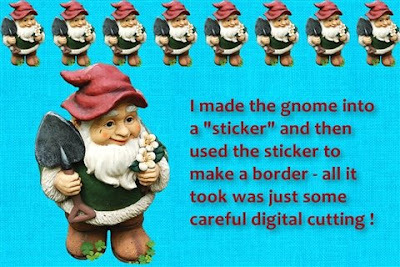 Once I imported this new "embellishment" into my Creative Memories StoryBook Plus program, I copied and pasted and then grouped a row of eight miniature gnomes to use as a border. I saved the border as another PNG file and imported it into my embellishment library. 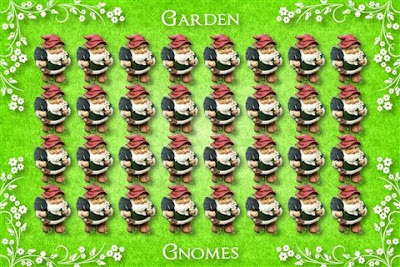 Then I copied and pasted the border row so I had four rows of gnomes. I added a green background color with a two tone gradation radiating from the center of the page. 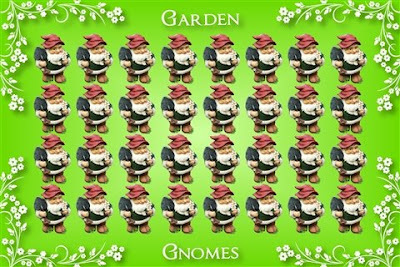 I grouped my four rows of gnomes and adjusted the size of the grouping to allow room for adding a border. I used a pretty floral motif in each corner and the added words "Garden Gnomes" in the Chocolate Box font. Then I made the corners and the words white and added a heavy shadow. Finally, I added the grassy texture to the background. The finished project is 4 x 6 and I can print it and use it for the front of a 5 x 7 card with a nice border. All because some college kids decided to make a garden! JenC and I are very excited with the responses to the new teaching blog "Let me Show you How to Do that" and the first two classes are filling up quickly. We both have some family things going on this weekend (Happy Mother's Day!) but we are doing our best to keep up with the emails and questions. Thanks again for your support. You are incredible! That's all I can say.